Phill Swagel reviews Too Big to Fail and Inside Job. The Hamilton Project, a research group in Washington, has just finished a comparison of college with other investments. It found that college tuition in recent decades has delivered an inflation-adjusted annual return of more than 15 percent. For stocks, the historical return is 7 percent. For real estate, it’s less than 1 percent. On today's Planet Money, we visit an underground vault that's full of money nobody wants. The money — bags and bags of dollar coins — is the result of a 2005 law that requires the U.S. Mint to print a series of coins bearing the likeness of each U.S. president. The problem is, people don't really like dollar coins. And there aren't enough people who are fired up about, say, Rutherford B. Hayes, to make much of a difference. So more than 1 billion dollar coins are now sitting, unwanted, in Federal Reserve vaults around the country. By the time the program wraps up in 2016, the Fed will be sitting on 2 billion unwanted coins, according to the Fed's own estimates. The total cost to manufacture those unwanted coins: $600 million. Everything you need to know about ethanol. The leading explanations for this involve health behavior -- including diet, exercise and smoking. For example, men 50 and older without a high-school education are more than twice as likely to smoke as those with a college degree. Exercise behavior also varies substantially. Among 45- to 54-year-olds in one study, only 16 percent of those without a high-school degree exercised vigorously at least once a week, whereas 56 percent of college graduates did. Paul Krugman says there was no Reagan revenue-growth miracle. Actually, I tend to agree with Paul on this one. I am also skeptical that across-the-board tax cuts increase tax revenue (although, unlike Paul, I think that tax cuts do generate significant dynamic effects and therefore are not as costly as static estimates suggest). What strikes me about Paul's blog post, however, is how completely unconvincing it is. He uses a chart that starts the Reagan era in 1979, arguing we need to correct for the business cycle. But would or should this persuade anyone? The null hypothesis being tested is that Reagan policies had a significant effect on revenue growth. But would any believer in that null hypothesis include the last couple years of the Carter administration as part of the Reagan era? Weren't the policies of those years precisely what Reagan was trying to reverse? Maybe Paul's chart might appeal to someone who already agrees with him, but I thought economists turned to data to try to persuade those who are truly undecided. It is hard to see how this presentation of the data would move someone who is yet to make up his mind. One more thing: What Paul calls "the Clinton miracle" might also be called "the Internet bubble." Update: In response to the above post, Paul says I was "pretending to be stupid." That is not how I see it. Instead, I was pretending that I started with a different prior worldview on this matter than I (and Paul) in fact have. I am reluctant to view people who disagree with me as "stupid." Instead, I prefer to try to see things from others' perspectives when presenting arguments and evidence. I believe that this less dogmatic approach is more likely to win friends and influence people. A 2009 study of the EDA [Economic Development Administration] by the nonpartisan Cato Institute collected numerous government oversight reports and documented widespread abuse of taxpayer dollars. The study noted that Senate Majority Leader Harry Reid is familiar with the EDA process. In 2008, he hand- delivered a $2 million EDA check to the University of Nevada, Las Vegas (UNLV) Research Foundation to begin construction of the "UNLV Harry Reid Research and Technology Park." As any university fund-raiser can tell you, a "naming opportunity" is a valuable resource. People are willing to pay big bucks to have buildings and other things named after them. In light of this fact, isn't it fair to say that Senator Reid received some nonpecuniary compensation from this recipient of government funding? Why should this transaction be legal when more explicit pecuniary kick-backs are not? Let me propose that Congress adopt the following rule: No institution receiving government funds should be able to name itself (or any part of itself) after any government official who had a hand in providing those funds. Moreover, QE2 distracts us from the real microeconomic, tax, and regulatory barriers to growth. Unemployment isn't high because the maturity structure of U.S. government debt is a bit too long, nor from any lack of “liquidity” in a banking system with $1.5 trillion extra reserves. Mostly, it is dangerous for the Fed to claim immense power, and for us to trust that power, when it is basically helpless. If Bernanke had admitted to Congress, “there’s nothing the Fed can do. You’d better clean this mess up fast,” he might have had a much more salutary effect. A profile of the great economist. Bruce Bartlett takes on Tim Pawlenty. Raghu thinks monetary policy is too easy. Are emerging and developed economies switching place? Alan Taylor ponders the question. He is going back to the University of Chicago. To replace him, can I suggest Jason Furman, my old friend and former student who is now #2 at the NEC? But nobody is proposing that the government deny you the right to have whatever medical care you want at your own expense. We’re only talking about what medical care will be paid for by the government. That is, under the likely scenario that healthcare spending keeps rising faster than GDP, the Center for American Progress would give government the power to prohibit people from buying expensive health plans with their own money. That is not my idea of progress. *Source: Page 43-44 of this document. I put the crucial phrase in bold. MIT economist Peter Diamond is withdrawing his name from nomination to the Federal Reserve, now that it is clear that the Republicans in the Senate will continue to block a vote on the nomination. I am personally saddened by this outcome, as I was when the renomination of Randy Kroszner was similarly blocked by the Democrats a few years back. Here is Peter's op-ed about the mattter. I have been struck at the heated rhetoric surrounding Paul Ryan's Medicare reform proposal. One thing is not often pointed out: Ryan's proposed "premium support" structure is in some ways similar to the plan put in place under President Obama's healthcare reform law. In both cases, an individual would shop among competing private insurers, on an exchange overseen by the government regulators. In both cases, the government would provide financial support for the "needy" (low-income households in the case of Obamacare, the elderly in the case of Ryancare). Why don't we see this parallel pointed out more often? The left wants to demonize Ryan, and the right wants to demonize Obama. Pointing out the similarities of their plans might make each of them seem, well, reasonable. 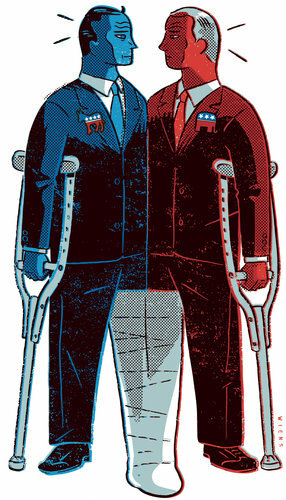 The overwrought politics of health care makes it hard to recognize common ground. By the way, the esteemed health economist Alain Enthoven had a column on the topic of Medicare reform in yesterday's Wall Street Journal that is well worth reading. An interview with the departing Fed governor. Several bloggers have pointed out these slides, based on a talk Nobelist Robert Lucas recently gave. I don't always agree with Lucas, but I almost always find him thoughtful and thought-provoking. This time is no exception.